You drive by the Frankfurt Fair, onto the A648 in the direction of Westkreuz and Wiesbaden. Leave the A648 at junction Eschborn (17) in direction of Eschborn, Kronberg, Schwalbach and drive along the Sossenheimer Straße (L3006). You are now on the Sossenheimer Straße. Change to the left-hand lane of the both lanes that lead straight on, as soon as possible and drive straight on at the 1st traffic light. After the 2nd traffic light please sort on the right track. Turn right before the 3rd Traffic light (Attention, others have right of way!) in the Hamburg road. Follow this road for about 550 m. After a sharp right turn into the roundabout and leave it at the first exit to the Mergenthalerallee. The Mergenthalerallee 73-75 is the third house to your right and is right in front of the new building of the German Stock Exchange AG (black skyscraper "The Cube"). 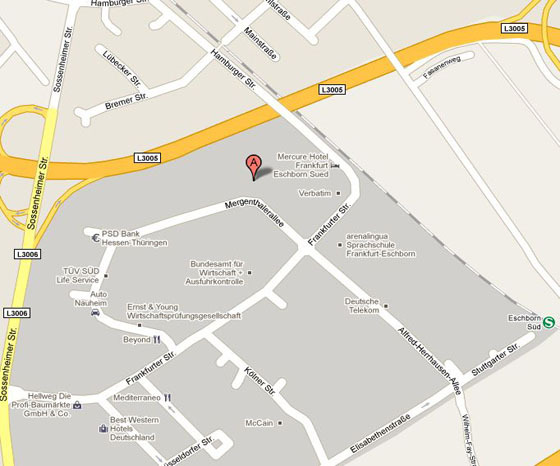 Turn right before the building, ring the bell at the gate and receive further information on where to park. The Azenio Business Center Eschborn is on the 14th floor. Take the A66, direction of Nordwestkreuz / Wiesbaden. Stay on the A66 and follow the road for 1.71 km. Change at the Eschborn interchange (18) from the A66 to the A648 in direction of Eschborn, Kronberg, Schwalbach, F-Sossenheim. Follow the A648 for 620 m. Leave the A648 at the Eschborn exit (17) towards Eschborn, Kronberg, Schwalbach and drive onto the Sossenheimer road (L3006). At the Westkreuz you change from the A5 to the A648 in direction of Wiesbaden / Höchst. Leave the A648 at junction Eschborn (17) in direction of Eschborn, Kronberg, Schwalbach and drive along the Sossenheimer Straße (L3006). At the Westkreuz you change from the A5 to the A66 in direction of Wiesbaden / Mainz, Höchst. 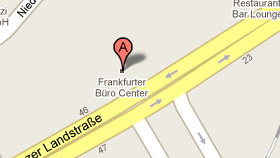 Stay on the A66 for about 1,42 km to the Eschborn interchange. Change at the Eschborn interchange (18) from the A66 to the A648 in direction of Eschborn, Kronberg, Schwalbach, F-Sossenheim. Follow the A648 for 620 m. Stay on the A648 and follow the road for about 139 m.
Leave the A648 at the Eschborn exit (17) towards Eschborn, Kronberg, Schwalbach and drive onto the Sossenheimer road (L3006). At Wiesbaden Kreuz, take the A66 towards Frankfurt. Leave the A648 at junction Eschborn (17) in direction of Eschborn, Kronberg, Schwalbach, Sossenheim and merge onto the driveway. Follow this road for 331 m.
At the traffic light, turn left onto Victory Road (L3006). Follow this road for 406 m. You now pass the entrance of Eschborn. Please take the S4 (direction Kronberg) or S3 (direction Bad Soden). At the station Eschborn Süd please get off and walk through the underpass to the other side of the tracks. You are in the Stuttgarter Strasse. Walk straight ahead (on your left is a P & R parking lot). At the end of the Stuttgarter Strasse you turn into the Alfred-Herrhausenallee. Go straight until the roundabout. At the roundabout, go straight into the Mergenthalerallee. The Mergenthalerallee 73-75 is the third house to your right and is right in front of the new building of the German Stock Exchange AG (black skyscraper "The Cube"). 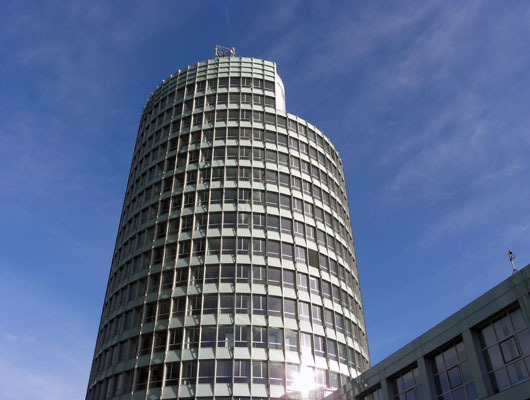 The Azenio Business Center Eschborn is on the 14th floor. Drive straight on and pass the driveway of Eschborn. Stay on the L3005 and follow the road for 3,10 miles. Leave the L3005 in the direction Sossenheimer road (L3006) and take the driveway. Follow this road for 210 m. Sort to the left! Turn left into Sossenheimer road (L3006) (attention on two tracks, others have right of way!). Follow the road for 438 m. After the 1st Traffic light, please sort on the right track. Please take the S8 or S9 (direction Hanau each) to the central station. At the central station, please get in the S4 (direction Kronberg) or S3 (direction Bad Soden). At the station Eschborn Süd please get off and walk through the underpass to the other side of the tracks. You are in the Stuttgarter Strasse. Walk straight ahead (on your left is a P & R parking lot). At the end of the Stuttgarter Strasse you turn into the Alfred-Herrhausen-Allee. Go straight until the roundabout. At the roundabout, go straight into the Mergenthalerallee. By taxi from the Frankfurt Airport 15 minutes.